The Arizona Department of Transportation challenged themselves to find opportunities to improve the way they do business. A collaborative team consisting of five utilities and four ADOT districts examined the utility encroachment permit process and looked for ways to make it more efficient. The team created tools that simplified and streamlined the permit process and that allowed the Department to more effectively communicate with utility companies during the process. 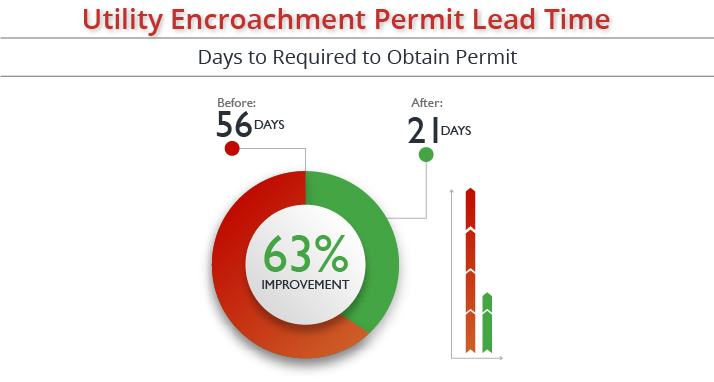 As a result of implementing a simplified process, the Department was able to reduce the approval time of their permit from 56 days to 21 days.